Bill McAvoy, a Sherman native, was a tremendous high school player under Hall of Fame coach Ron Marks. He played on an undefeated Class S state championship team at Sherman High School in 1967, the last year before that school was part of a consolidation that formed Katahdin High School. McAvoy then played under Marks on the first Katahdin team, helping the Cougars to an undefeated regular-season finish. 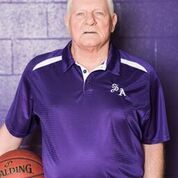 After high school, Bill attended Unity College where he was a Maine College All- Star for three years and ended his career as Unity’s all time leading scorer before returning to northern Maine to begin teaching at Central Aroostook High School. His teams have won over 400 games, including the 2000 Eastern Maine Championship while at Kathadin High School.